THE ousting of former President Robert Mugabe by political and military elites will result in more of the same abuse of Zimbabweans unless the Sadc joins forces with world powers to effect real change. Mugabe spent the last 17 years of his reign worrying and warning about the West's regime change agenda, whose supposed goal was to remove him from power and recolonise Zimbabwe. In the end, it was not the CIA or MI6 that ended his 37-year rule. It was the military men he commanded during the guerrilla war of the 1960s and 1970s - and during his years in power. His reign was ended by his own comrades, who helped him butcher opponents and plunder the nation's resources. These were the very people who were supposed to protect him from the proponents of regime-change agenda. How ironic. How ego-deflating for the nonagenarian. What an ignominious end to the reign of a man who could have gone down in history as one of Africa's great revolutionaries. A humiliating ending for someone who, at some point, was mentioned alongside giants such as Tanzania's Julius Nyerere, Zambia's Kenneth Kaunda, Mozambique's Eduardo Mondlane and Algeria's Ahmed Ben Bella. Zimbabwe's founding father will not be remembered for his liberation stripes, nor for his creditable (albeit bloody) first decade of governance. He will also not be remembered for his contribution to the liberation of South Africa and Namibia, and the role he played in pioneering the formation of Sadc. Instead, he will be remembered for all the wrong things: brutality, economic ruination and the destruction of a stable democracy. In his final years in power, Mugabe became the object of hatred among Zimbabweans, save for the most loyal Zanu-PF supporters and beneficiaries of his patronage system. So hated is Mugabe that even former Rhodesian Prime Minister Ian Smith once challenged him to a joint stroll down Harare's CBD without bodyguards to see who, between the two of them, the people would attack. In November 2017, the people of Zimbabwe celebrated their hated leader's overthrow in characteristically Zimbabwean fashion: they did nothing. They waited five days before taking to the streets to demand what the military had already achieved – the removal of Mugabe. For the rest of the week, Zimbabweans simply went about their normal business of being placid and accepting of whatever the gods gave them. Well, what the gods have given them is Mugabe's younger and more evil sibling. The 75-year-old President Emmerson Mnangagwa, the man who will take Zimbabwe into its "new" future, is the ugliest face of its past. As one of those at the heart of Zanu-PF's securocratic core, Mnangagwa was central to some of the worst atrocities of the Mugabe regime. In the 1980s, when Mugabe wanted to crush the opposition Zapu so as to swallow it inside Zanu, Mnangagwa was at the forefront. As intelligence minister, he oversaw the war on so-called dissidents in Matabeleland and Midlands. The offensive resulted in the deaths of more than 22 000 people, most of them civilians. Some researchers say that number is hugely conservative and could be above 100 000. Villages were razed, people were burnt and whole families buried alive during that offensive. It was menacingly known as the Gukurahundi - the downpours that wash away the winter chaff before the proper summer rains come. 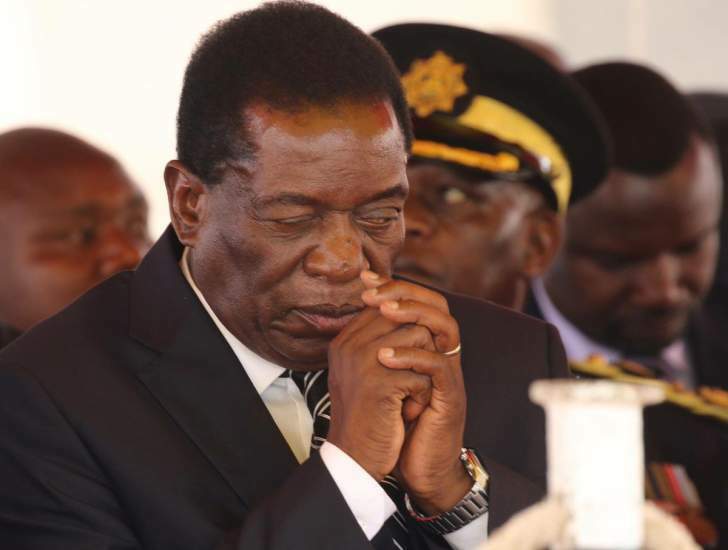 Although Mnangagwa and his Central Intelligence Organisation (CIO) were the main instigators, he laid the blame squarely at the feet of the army - mainly the notorious Fifth Brigade elite unit. The Gukurahundi cemented Mnangagwa's place in Mugabe's cruel heart, so much so that even when he twice lost his constituency seat in parliamentary elections, Mugabe would nominate him for the additional seats that the President was entitled to fill - thus justifying his place in Cabinet and in all decision-making structures in government and the party. Mnangagwa was to prove crucial to Mugabe's survival in the first decade of this millennium, when Zanu-PF and the security establishment decimated the opposition and civil society, and rendered Zimbabwe a fully fledged dictatorship. He has been implicated in some of the worst looting of State and mineral resources by Mugabe's lieutenants. The "more of the same" does not end there. The architect of the coup on Mugabe is just as terrible as the man who will benefit from it. General Constantino Chiwenga (retired), who is more a politician than a soldier, was on the ground in Matabeleland during the Gukurahundi. One Brigade, the Bulawayo-based unit that Chiwenga commanded, provided logistical and other ground support to the Fifth Brigade. Chiwenga's main co-conspirator in the coup was (retired) Air Force chief Perence Shiri, who headed the murderous Fifth Brigade in the 1980s. As thick as thieves through the decades, the two men worked alongside then police chief Augustine Chihuri and CIO director Happyton Bonyongwe in executing the brutal repression and subverting of successive elections in the period after 2000. So determined were they to protect Mugabe and Zanu-PF's hegemony, that these men called a joint Press conference with all the top security chiefs ahead of the 2008 presidential elections to declare that in the event that the now late MDC leader Morgan Tsvangirai won, they would not recognise him as commander-in-chief because he had not fought in the Chimurenga war. After Tsvangirai won against all odds and forced a run-off, the security forces launched another repressive onslaught. Their forces kidnapped, tortured and murdered those who stood in Mugabe's path. The key Zanu-PF constituency that saw to Mugabe's exit was the Zimbabwe National Liberation War Veterans' Association. The leadership of this group comprises battle-scarred soldiers, unlike our local Disneyland version, which has cartoon characters such as Carl Niehaus, Des van Rooyen and Kebby Maphatsoe at the helm. Zimbabwe's liberation war veterans are Zanu-PF's most hard-core ideologues and consider themselves custodians of the party's legacy. You mess with them, you end up like Kebby - if not worse. Mugabe, his wife Grace and their allies in the G40 faction made the mistake of alienating this grouping by targeting heroes of the Chimurenga, including Mnangagwa. But what is likely to have tipped the war veterans over the edge was that the G40 group wanted Mugabe succeeded by Grace, whose birthplace happens to be Benoni in South Africa. A war veterans leader was said by eavesdroppers to have been overheard exclaiming that even the Salvation Army would not let itself be led by someone from Benoni. The war veterans were the storm troopers of the post-2000 repression. Having bolstered their numbers with youngsters who were born after the revolution, they led the farm invasions and meted out the worst brutality on political opponents and civil society activists. They even ran pop-up prisons, where victims would be held and tortured. Among their most despicable weapons of repression was to kidnap women and girls, and take them to all-night pungwes (vigils). There, they would be repeatedly raped before being released back to their communities to tell their tales and spread fear. Zimbabwe's future will now be crafted primarily by these elements: dirty Zanu-PF fossils, a security establishment that is an unashamed extension of the ruling party and a thuggish grouping of militias. Their arms are covered in blood right up to the armpits. They are wholly dedicated to the prolonging of Zanu-PF and the protection of their own interests. The immediate priority of this centre of power will be to eliminate internal opposition. So the G40 leadership will ring in 2018 from behind bars, in exile or on the run. From there, the Mnangagwa power brokers are likely to turn their attention to neutering the political opposition and civil society after the elections. The climate of terror and fear that has prevailed during the run-up to previous elections is likely to be just as bad. Do not bank on Zimbabweans taking advantage of this historic opportunity to change the direction of their country. Even if they do take to the streets, as thousands did recently, this is likely to be ineffective and short-lived. Previous attempts at protest have ended with a whimper because Zimbabweans retreat indoors or flee across the border at the slightest whiff of tear gas. You would much sooner get a Buddhist monk to strap-on an explosive suicide belt than get Zimbabwean activists to mount a sustained mass action campaign. The only intervention that could prevent this bleak prognosis is a Sadc that takes its duty seriously. Sadc needs to take the lead in facilitating an international effort to help Zimbabwe on a path of political, economic and social reconstruction. It needs to do this together with the African Union, international bodies such as the UN, and major powers. But for this to happen, Sadc would need to drop its knee-jerk ideological distrust of the West and debilitating paranoia about major powers' alleged regime-change agenda. These ideological blinkers - worn mainly by the former liberation movements that govern the main countries in the region - are what led to the cosseting of Mugabe during the time of "quiet diplomacy". Zimbabwe's reconstruction is going to need a global effort. The strongmen in charge of the country have to be bullied into accommodating other societal role players in mapping the way forward. If this does not happen, Zimbabwe will enter an era of worse tyranny and economic chaos. And more blind beggars would pop up at South Africa's traffic intersections.